Concentrating upon applications that are most relevant to modern physics, this valuable book surveys variational principles and examines their relationship to dynamics and quantum theory. Stressing the history and theory of these mathematical concepts rather than the mechanics, the authors provide many insights into the development of quantum mechanics and present much hard-to-find material in a remarkably lucid, compact form. After summarizing the historical background from Pythagoras to Francis Bacon, Professors Yourgrau and Mandelstram cover Fermat's principle of least time, the principle of least action of Maupertuis, development of this principle by Euler and Lagrange, and the equations of Lagrange and Hamilton. Equipped by this thorough preparation to treat variational principles in general, they proceed to derive Hamilton's principle, the Hamilton-Jacobi equation, and Hamilton's canonical equations. An investigation of electrodynamics in Hamiltonian form covers next, followed by a resume of variational principles in classical dynamics. 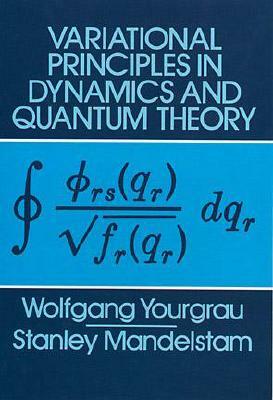 The authors then launch into an analysis of their most significant topics: the relation between variational principles and wave mechanics, and the principles of Feynman and Schwinger in quantum mechanics. Two concluding chapters extend the discussion to hydrodynamics and natural philosophy. Professional physicists, mathematicians, and advanced students with a strong mathematical background will find this stimulating volume invaluable reading. Extremely popular in its hardcover edition, this volume will find even wider appreciation in its first fine inexpensive paperbound edition.